1984 was a memorable year. Not only was it the year in which much of the West switched over to a hellish dystopia as prophesied by George Orwell back in 1949, but also this movie came out. 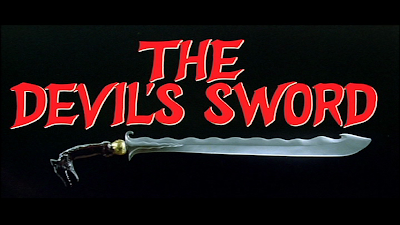 In a lot of ways The Devil's Sword is a reaction to the founding of this nightmarish society and so in hindsight we can attribute the restoration of the Free West solely to stars Barry Prima, Advent "Advent" Bangun, and of course Belkies. The movie begins like many others before it, and many others since. An old crazy man is relaxing in his mountain shack when a meteorite falls to earth. He does what anyone would do in such a situation- forges a sword with no real benefits but with the power to destroy all of humanity should it fall into the hands of absolutely anyone. And then his shack collapses. Later on, the evil Crocodile Queen sends out her beefy man servant Banyujaga to steal some effeminate looking guy for her. But little does Banyujaga realize that his sworn enemy Mandala is in town searching for The Devil's Sword! 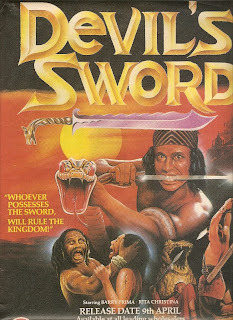 Who will get the sword and what will he use it for? The many parallels between 1984 and this movie are so obvious I won't even go into them. Instead I want to talk about how awesome everything in this movie is. You know how when you were little you'd catch these crazy movies on Kung Fu Theater or whatever on the weekends, and the perfect storm of hilarious dubbing and stupid wire effects converged over the tranquil sea that was society before the Matrix came out and overexposed wire kung fu to the point where it is a groanworthy punchline? And now you are grown up and you hunt down some of those movies in a fit of nostalgia and they just seem boring and tame with your sophisticated adult tastes, what with your iphone and your animes and your hospital dramas? What a disappointment! Well I am telling you right now that if you watch this movie you will be transported- magically and without warning like in one of those "adult turns into a kid overnight and realizes that there is more to life than money and success and power" movies- back into the age of footie pajamas and sugary cereal on Sunday morning. Because this movie is totally out of control and your ability to handle it is dubious at best. The violence comes suddenly and without mercy as limbs are shorn like wool from a sheep. Heads are severed and then the fight begins. Mandala is forced to crawl through a "spooky cave" that looks like something a bunch of kids put together under a sheet in the backyard for a Halloween project. I won't even get into Laser Crocodile. I was going to wrap this up by saying this is by far the best movie to have come out this year, but I checked and a lot of really great movies came out in 1984. But since you've probably already seen all those, watch this one instead.